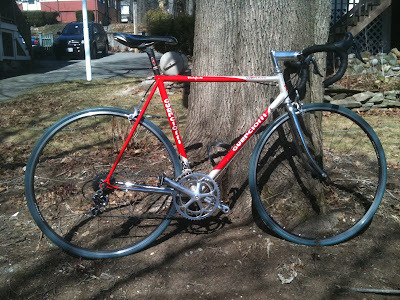 After an idle conversation with a friend of mine recently about my affection for lugged steel bikes, he sent me a few posts from Craigslist - for some reason, lots of beautiful bikes are coming up in Boston nowadays. One particularly struck my fancy - a Guerciotti from 2000 kitted out with all Campagnolo Record from 2003, plus carbon handlebars and seatpost. And superbargain to boot! Even included Speedplay pedals. So I set up an appointment to go see it in Belmont, walking distance from the office. I did just a short test ride, but it felt very light, nimble, and solid - and of course the Campy stuff shifts, stops, and goes like a dream. The dude selling it raced at one point, and he assembled this bike several years ago, but hasn't ridden in years. I think even he realized that he'd underpriced it, since he bumped the price up by $200 before I turned up to see it - but this must have been in case I didn't buy, because he accepted the original price, and I rode off with it happily! It's been supercold and I've had musical thingies every night since, so I've scarcely ridden it yet - but I'm really excited! There's been a bike path between Alewife station and Blanchard Rd in Belmont for ages. As long as I've known it, though, it's been hardpacked gravel, hard to find, and treacherously close to the railway line. So today on my way back from the periodontist, I saw the new entrance from the Belmont side - very nice indeed! The nice wide paving with a yellow line down the middle was too inviting to resist. I started down the path and wasn't daunted by a few snowy spots, which I rode or walked through. The newly-paved path looks great (still dangerously close to the railroad tracks, though)! Unfortunately, just as Alewife station was about to come into view, the paving stopped abruptly - I guess they haven't finished the work yet! And the snow and ice really precluded riding further. Nevertheless, I'm glad I gave it a go, and once everything warms out and dries up, it'll be great - pavement or no!